Hello Miami - Hobie Cat Catamaran Sailing Excursion in Miami! Hobie Cat Catamaran Sailing Excursion in Miami! Sailing on a Hobie Cat catamaran is the best way to explore Miami’s beautiful Biscayne Bay. Choose to rent a catamaran for your own adventure, you will receive all necessary instructions prior to going out by yourself in the beautiful bay of Key Biscayne. Discover the natural beauty of Biscayne Bay while you glide through the water on this Miami catamaran experience. While sailing through the bay, you will pass a variety of deserted islands, marinas and city sights like the Museum of Viscaya, the Cape Florida Lighthouse and Stiltsville, home to stilt houses that have been part of the bay for years. Beach your Hobie Cat on one of the many sandbars to enjoy a swim in Miami’s clear waters, and watch out for dolphins, manta rays, sea turtles and manatees, all of whom may pop out of the water at any time. Biscayne Bay is protected from most weather conditions, which makes sailing through the bay fun and easy for sailors of all levels. The sunny weather of south Florida allows you to sail year-round – no wetsuits needed, just a whole lot of sunscreen! 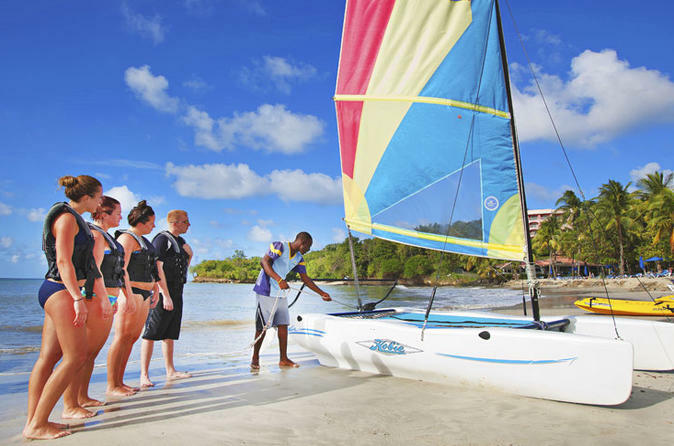 Catamaran Rental: If you choose to rental option, you will receive a 15-minute briefing on how to operate the Hobie Cat catamaran before you head out to explore the bay. A rescue power boat will also be available in case of emergency.